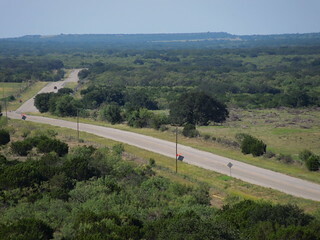 This view is looking southward along US 377 from the top of an observation tower in the "Heart of Texas" roadside picnic area. Brady TX is about 20 miles in that direction. About 1/4 mile in the opposite direction is a roadside historical marker interpreting this area as the geographic center of Texas (shown in #2700); and about a mile further on is the minuscule burg of Mercury.